CiteKeeper's three main features — tags, snippets, and projects — are designed to help you get work done faster and cheaper. Users add quotes to their personal tag libraries by associating them with one or more words or phrases, called tags. Tags can be public or private. When you make a tag public, it shows up in the global tag library. This helps everyone — for example, if you tag a quote with "contracts," other users will be able to find that quote by clicking on that tag. What is it? The global tag library is a collection all the tags that users have entered. The more times a tag is used, the bigger it appears. The global tag library is often a good starting place to find authority. You can see an example of it to the left. How does it work? Click on the tag for that topic to see what other attorneys thought was important. 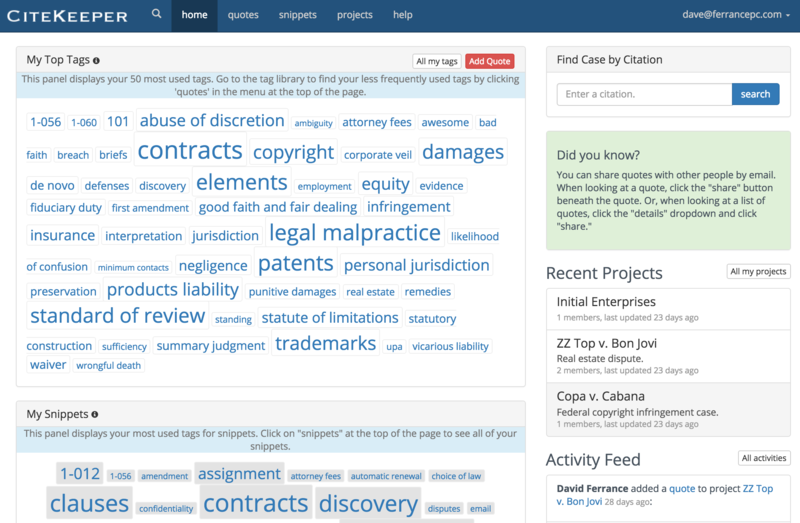 The bigger the tag, the more quotes citeKeeper has for that topic. Drill down on multiple tags to find exactly what you want. When you find quotes that you like, add them to your personal library. Click the picture to the left to see how it works. All those tags look complicated! How do I find just what I need? The global tag library contains thousands of tags you will never need or care about. It's great when you are searching for something you haven't used before. But for your most frequently used cases, citeKeeper maintains a Personal Tag Library just for you. Your Personal Tag Library appears on your home page. It works the same way as the global tag library: the more you use a tag, the bigger it gets. Click on the tag to see all the quotes you have marked with that tag. 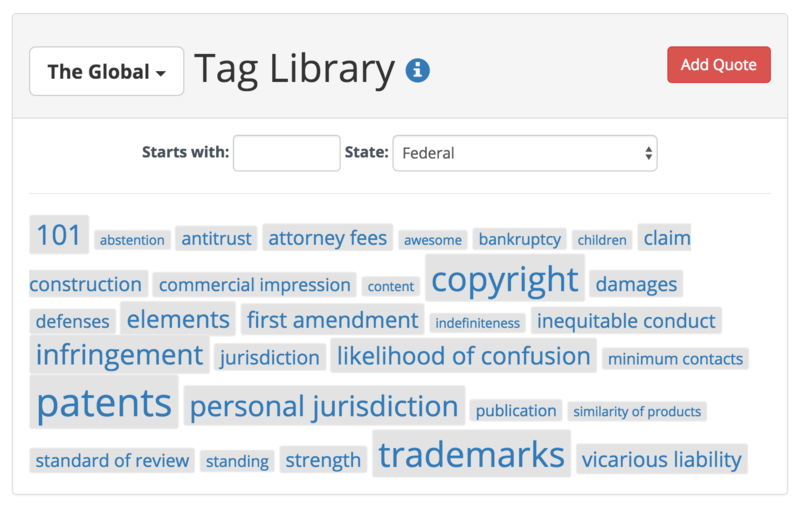 Unless you choose to share tags with your firm, only you can see your personal tags. How do I build my library? Adding quotes is easy. You can find quotes by browsing the tag library or by searching. When you find one you like, simply click on its tags to copy it to your library. If the quote isn't already in the system, you will have to add it. CiteKeeper does not contain everything. CiteKeeper contains thousands of quotes. But it doesn't contain everything. Unlike traditional research tools, CiteKeeper does not have a library of every opinion. Instead, it only contains quotes that attorneys thought were important enough to add. CiteKeeper is not a substitute for a traditional research tool. It works hand-in-hand with your traditional tools to help you keep track of the most important authority to you. How do I add a quote? Find the case that the quote belongs to. The easiest way to do this is to search for the case by its citation. Once you've found the case, click the "Add Quote" button, then enter the text of the quote and the tags that go with it. Snippets are tags for your frequently used text. 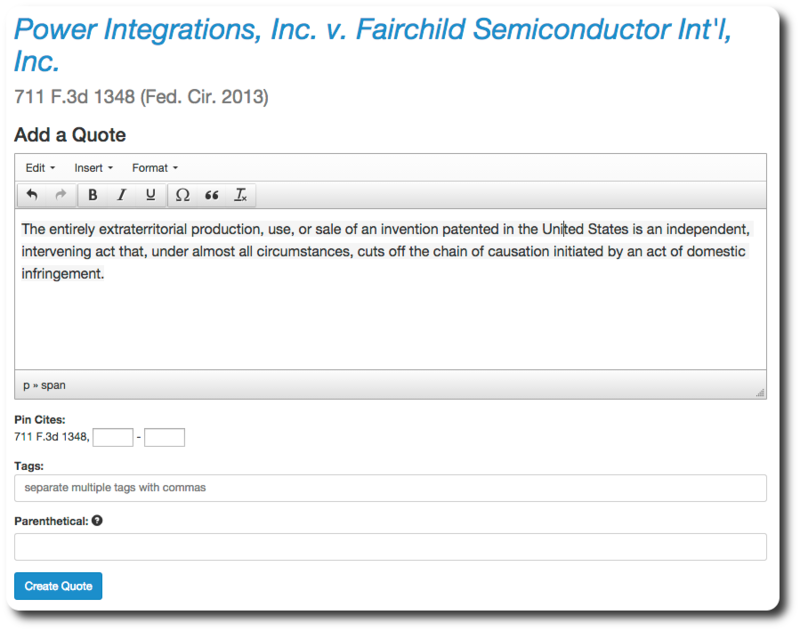 You've already tagged the case you use for the standard for summary judgment. Snippets let you store and tag your frequently used text. Do you have one paragraph for the standard for summary judgment as the movant, and another for when you are the non-movant? Store each as a snippet, and find them quickly and easily when you are drafting. Snippets are great for discovery. Snippets are also great for contracts.